Well, once again I had a past student return to learn more. Tina returned for 3 days to learn flying birds, european mounts, and ask 101 questions on everything under the sun that one could possibly run into in the world of taxidermy. I think I was able to answer 99 of them. I can't thank my present and past students enough for allowing me to teach them. There are many schools out there to choose from, I am truly honored to have so many return students! 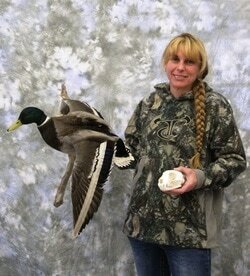 "At 64 years old and semi-retired I was finally able to pursue my dream of doing taxidermy. I recently returned from Troy Rose's Artistic School of Taxidermy where I spent six days of training. Upon arriving at his school in Kooskia, Idaho I was amazed at the beauty of the surroundings and the wonderful accommodations. While I was there I viewed deer, elk and turkeys on the hillsides and in the yard. I mounted a full-size bobcat, bobcat rug and a shoulder mount black tail deer that turned out beautiful. Troy’s combination of knowledge and one-on-one teaching ability is second to none. He truly is a master of the trade. I was able to work long hours in the shop in order to finish my work. His help and advice were always there whenever I needed it. Thanks again for all the effort you gave to make sure l left there with first class knowledge and beautiful mounts. I cannot wait to return to further advance my skills with different animals. I recommend anybody wanting to learn taxidermy or advance their skills and enjoy first class accommodations that you will truly enjoy your time spent there at the school." Troy, thanks for a great time! Wow, I don't know where time went, but 5 days are gone and another satisfied student has emerged from training with some outstanding pieces!!! Jen from Boise, Idaho learned how to do advanced bird work and habitat bases, along with a badger rug. Jen's keen eye for detail showed in everything she did. Way to go Jen!!! "Well, I suppose if you like being stuck on a mountain top 20 miles from nowhere, in a beautiful five star home with your own deluxe suite, learning the art of taxidermy from a master... then, you might look into Mr. Rose's schooling. I must warn you though, the accommodations are perilous! The first thing you will notice upon arrival is the complete isolation from civilization, and an over abundance of wildlife. One wrong move out here and you're lunch... You wouldn't want to end up turkey food, would you? A monstrous tom tried to eat me for breakfast one morning while I was out taking photos! I even managed to get a few pictures of vultures as they awaited my impending doom! Luckily, I had back-up! And now Troy has a monster turkey to mount! And better yet, I got to eat turkey all week! Not to mention fresh-picked morel mushrooms, simmered up savory-like in a sweet buttery marinade. (watch out, his food might just kill you). But aside from the perils of being swept away by rogue vultures, devoured by ravenous turkeys, and trampled by audacious deer, the real thing you have to watch out for is Mr. Rose's schooling! Woe betide he who leaves a mess in Troy's shop! Fail to clean up after yourself, and you may just find yourself strung out for bear bait the next morning! And besides, is it REALLY worth results like this? I dunno, folks. I gotta wonder sometimes about these taxidermy schools... You never know WHAT your'e gonna get! ...Well, of course I'm full bologna. Although, having a certain love for the "great outdoors" and its wildlife does make your stay all the more magical. I loved the photo opportunities, and got a few golden shots to add to my reference albums. Fighting turkeys, eating turkeys, strutting turkeys, running turkeys, plus various other bird species and lots of deer. Honestly, it was a grand experience. I completely re-learned most of my taxidermy skills. I am far more confident now, especially with my birds. My attendance was focused on rounding off some of my rough edges, and learning a few skills and tricks I was apprehensive to try myself. I feel it was worth every penny- I've been to taxidermy school before, but had I gone to Troy first I'd probably be a lot further than I am now! On top of the invaluable learning experience, I could only expect that everyone's stay might be as eventful as mine. Witnessing the turkey "hunt" (more like ambush from the back door) was a fun addition to my stay. He was a big, beautiful bird... and he tasted great too. On that note, as it has been said, Troy will spoil you with home-cooked meals three times a day. And I gotta admit- my prior schooling was put to shame by Troy's five-star accommodations. I expect I will go back again someday, when I open a new chapter in my taxidermy career and need a little more "rounding out". Thanks for the opportunity and experience, Troy. I wish you luck in building a prestigious reputation for your school- it won't be too hard!" I spent 2 really cool days with Doug instructing him on antler art. We were not able to finish the floor lamp, but we got it drilled and ready for wiring. Doug, I hope I eased your frustrations from your prior attempts! Your stuff came out fantastic!!! All I can say is "Can I have it for inside my house?"